We hear all the time about specialty rods, how they’re an important part of the sport because they help us fish more efficiently. That’s true, and some of the most important and useful are what are commonly called crankbait rods. 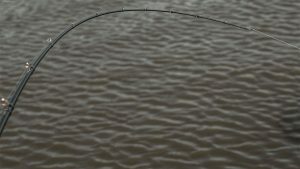 The thing is, though, they really should be named treble hook rods or reaction bait rods because the design features they have will help you fish more efficiently with any bait that has a treble hook on it. I’m thinking about hard jerkbaits and topwater plugs as well as crankbaits. The basic, and most important, thing about one of these rods is its action. They have a parabolic bend to them that delays the hookset and that forgives mistakes. A lot of the rods we use have a backbone up from the handle and then a tip that bends fast under pressure. In the most extreme cases they look like a candy cane when they’re loaded up. A reaction bait rod arcs somewhat evenly from the handle to the tip in a soft, steady and clean bend when it’s under load. The best way I know to describe it is that it looks like the moon when it’s moving away from the new phase. Check out some pictures of that and you’ll see exactly what I mean. I designed a series of rods with Abu Garcia for just this kind of fishing. They’re called the Abu Garcia “Ike” Delay Series Casting Rods. There are five of them in all. They come in different lengths and are designed to handle different weight lures but they all have a moderate action. And, to each one is designed and engineered to do three things. These rods load up easy and without much effort. You can throw almost any lure a mile with them including lightweight balsa baits. The more distance you get with each cast the more water you can cover in the same amount of time. The “Ike” Delay Series rods will radically increase your casting distance while giving you greater accuracy. With any lure that’s armed with a treble hook you need to delay your hookset for at least part of a second. The bass needs to get the whole package in her mouth before you drive the hooks home. If you don’t, you’ll get a poor hookset and you’ll lose a lot of fish — unnecessarily. Topwater lures are especially prone to problems like this. It’s almost impossible to wait to set the hook after a big splash makes your walking stick or popper disappear. Even pro anglers who spend 200 days or more on the water every year have trouble waiting. The “Ike” Delay Series will do the waiting for you. Even if you snap the rod too quickly, the parabolic bend in the rod will give you a short delay, just enough to get the hookset you’ll need to get her into the livewell. We’ve all had it happen to us: A nice bass is right at the boat, just under the gunwale. But, just as we reach for her she makes one last lunge breaking the line or tearing the hooks out. Mostly that happens because there’s no give when she takes off on her last run. It’s sort of like jerking hard on a knot. There’s no give so even the best of them will break. But if you pull slow and steady that same knot will hold because there is some give. The “Ike” Delay Series rods will give you the give you need to land more fish. Now, I want to be fair. My rods aren’t the only ones that’ll do these things. There are other good rods available. The “Ike” Delay Series rods are, however, the ones I rely on when I’m fishing a $100,000 Bassmaster Elite Series Tournament, or the Bassmaster Classic like I am this week.